Disc brakes for dropbars and 650B wheels; they’re coming. It is well known that SRAM is making an integrated lever for hydraulic braking and mechanical shifting, TRP has shown a prototype hydraulic lever designed to integrate into Shimano’s Di2 electronic shift system, and it would be foolish to doubt that Shimano has a hydraulic/Di2 waiting in the wings. Conventional wisdom says that cyclcocross racing will be where disc brakes will make their biggest impact, but to my perspective that isn’t very interesting. My Redline Conquest Carbon, though disc compatible, has Avid Shorty Ultimate brakes that are tuned almost to perfection without the complexity of disc brakes. Though there are definitely conditions that would favour disc brakes such as deep, sticky mud or icy snow, in none of the races I did last fall did those conditions exist enough to really warrant disc brakes. Granted, I’m not a big dude who needs a ton of brake power , but I’m just not motivated to change my whole setup just for the remote chance that there might be that one ridiculous section out of 8-12 races this fall. It would be different if today’s cyclocross bikes were more offroad worthy, so that I could also do some technical riding that would really scream for strong brakes. Back in Gainesville FL during the late ’90s, I had a steel Bianchi cyclocross bike that I could ride everywhere with ~700Cx42mm tires (but the brakes sucked; wish I had those Shorty Ultimates back then). Recent cyclocross bikes remind me of whenever I talk about getting a XC mtb on this blog, and someone always writes in that today’s XC rigs are designed for the pro world cup racing, which “has nothing to do with what normal people see on trails.” Now that in itself is a debatable opinion, but a similar thing could be said about the abilities of bikes built for cyclocross racing nowadays. One of the appealing ideas about cyclocross bikes is that they are purported to be extremely versatile, but recently they have become much more focused on intense yet relatively nontechnical racing. Sure, that doesn’t exactly make them single purpose; there has been a recent trend for “gravel grinders” (that is races on gravel roads and unimproved rural roadways) for which the modern cyclocross bike is nearly ideal. And cross bikes can/have often been used as commuter bikes and sometimes even touring bikes (not so much the latest carbon bikes), but today’s cyclocross bikes do seem much more like a road bike that you would take offroad only because the race course has tape leading you from the grass path into a 10M long mud puddle. This reflects trends in race courses as well as the UCI-mandated 33mm max tire width. Nothing defines a bike’s terrain limits as much as the size of its tire contact patch. A 700C x 33mm just isn’t that big, not compared to a 26” x 2.25”. If you built a cyclocross bike around the XC mtb wheel, you’d have to change the bottom bracket drop to compensate for its smaller outer diameter. But then you’d be stuck if you actually wanted to race UCI-rules cyclocross because there is almost nothing in knobby 26” tires that is 33mm (1.25”) wide. Well, what about using a 29er wheel and 29” x 2.25” tire, since that actually is 700C? Well, sure, but then the geometry of the cyclocross bike would have to change a lot because of the sheer size of the wheels (longer chain stays, taller fork, etc), and in the end you’d still have to compromise the BB drop for either the 700 x 33 or 29” x 2.25” tires. 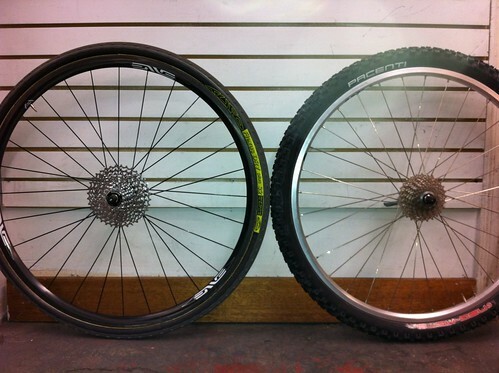 Crap, what I really want is a way to run a regulation cyclocross tire and a tire 2.25” wide in the same frame. You know, like if the tires had the same outer diameter. But that is impossible on the same rim, because a 2.25” tire would be taller, so the rim would have to be smaller. Not a 26” mtb wheel/rim, because I’ve already pointed out how that wouldn’t be tall enough to match with a 700C cyclocross tire. What I would really need is a rim in between 700C (622mm ISO) and 26” (559mm ISO)…something like the 650B (584mm ISO) that all those Rivendell-riding, retro-grouch francophiles fervently espouse for neo-classic randonneur bikes. Wait a minute…there is such a thing as knobby 650B, or as people sometimes call it 27.5” (please don’t). I know because I ridiculed it as “stupid” a year or two ago. It turns out that a 650B x 2.25” and a 700C x 33mm are within 3mm of the same outer diameter. I never knew knobby 650B rocked!! Oh, but then again….if the rims are different diameters, then cantilever brakes may not be able to accommodate both 650B and 700C. Bummer. The only thing that would cure that is a brake that was independent of the rim diameter…maybe worked off the wheel’s hub….like a disc brake. A disc brake?!?! Sweet, I know they exist because I just said I didn’t care about them 3 paragraphs ago!! I love disc brakes, I gotta have them! So theoretically, disc brakes would allow you to swap out the knobby 650B wheels and 700C cyclocross wheels with minimal effect on gearing or bottom bracket height, because the outer diameters of both wheel sets are practically identical. Now the lateral tire clearance is the problem: a 56mm wide knobby 650B will not fit a standard production cyclocross frame/fork that was built for the UCI-mandated 33mm tire. So we’ll be looking at custom for this project, though except for touring forks I would prefer to a stock carbon fork rather than fabricate it out of steel. Ritchey makes a full carbon disc fork that is 409mm tall (axle-crown), which is pretty close to a typical cyclocross fork of 395mm, but for the frame my ideal material would be titanium, similar to Byron’s “D-Plus” cyclocross project. The clearance at the rear triangle is not quite easy, as the chainstays would require significant shaping to fit a knobby 650B in the same chainstay length as a cyclocross tire/wheel. It’s not as bad as trying to fit a full 29er wheel (with an outer diameter far larger than 650Bx2.25”) in a chainstay length less than 430mm (the design won’t require a curved seat tube nor would the tire foul the front derailleur). But it will be necessary to use a MTB crank rather than a road crank, because the chainrings will be smaller and further outboard to give room for the drive-side chainstay to get around the fat tire. The chainstays will likely need a dramatic s-bend. The seatstay material would be so easy, because i can get away with really light tubing since they won’t be supporting brake bosses or resisting brake forces. Designing the bike to use only mtb cranks forces a wider Q-factor for the pedals and limits the gearing options. However, both SRAM and Shimano offer their high-end 2×10 cranks with a narrow Q-factor option of ~156mm with regular mtb chainline, and it’s really the small chainrings and wider chainline that are necessary for clearance, not so much the clearance of the crank arms themselves. The narrower the Q the better for me, and 156mm is almost a road triple crank dimension. As for gearing, that really isn’t an issue for me since I like to spin smaller gears. My regular CX bike has a 44/34T chainring set-up. On this planned bike, I think I’d set it up with SRAM’s 45/30 or 42/28 and a 11-34 on the back. That way I could race CX almost entirely in the big ring, but for adventure riding I’d have some really low gears available for single track or if I wanted to take it loaded touring. And the idea that I could also use the bike for loaded touring leads me to another happy effect of having two wheel sizes for the same bike. When designing a bike that might do both cyclocross and touring, one of the compromises that must be made is the bottom bracket height, which is the result of tire outer radius and the distance the bottom bracket hangs below the vertical height of the wheel axles (i.e. bottom bracket drop). Bottom bracket drop is a fixed dimension but I can exploit different wheel/tire options to change the bottom bracket height. For touring you’d want a lower bb for stability while riding and easier maneuvering a loaded bike while straddling, and for a cyclocross bike you would want a higher bb height for clearance especially in sand. While we are talking multiple uses, for single track riding you’d want even higher for clearance over trail obstacles like rocks and roots. But if for touring I used 650B x 38mm tires, the bottom bracket drops nice and low to a Rivendell-like height, and of course, touring and randonneuring have been the traditional use for 650B. Thanks to Rivendell, Bicycle Quarterly, and Panaracer, 650B x 38mm are are relatively easy to find, though not exactly common. Then change out the wheel or tire for either 650B x 2.25 or 700C x 33mm, and the bottom bracket height becomes good and high. If there would be any compromise, it would be that the knobby 650B tire is actually 3-5mm smaller in diameter than the 33mm CX tire, and the 650B mtb tire will compress more under rider weight than the 700C CX tire. So it would have been ideal if the 650B knobby gave the highest bb position, but I don’t anticipate that there will be an issue if I use a bb drop of about 60mm. Previous Previous post: Unicorn Bikes on Every Device!